In March this year, I mentioned about Acquia's Enterprise Drupal distribution in this blog. Now, seven months pass and Acquia is ready for its commercial Drupal product/service. Acquia Drupal - Acquia's enterprise Drupal distribution. It is Drupal plus several contributed modules plus Acquia Network integration module. Drupal is open source, Acquia Drupal is also open source. Everyone can download them for free and has freedom to tweak them like all other GPL software. However, Acquia Network is not free (that's how they make money), like RHN. Fortunately, Acquia is a startup company and they have free trial period for Acquia Network that everyone can try. Since I'm a Drupal junkie, let's look at the product first, then the service later. In technical description, Acquia Drupal is just a customized Drupal 6. It comes with several popular third party modules (e.g. CCK and Views) and is tweaked for better integration with the Acquia Network. But in consequence, it is still Drupal. 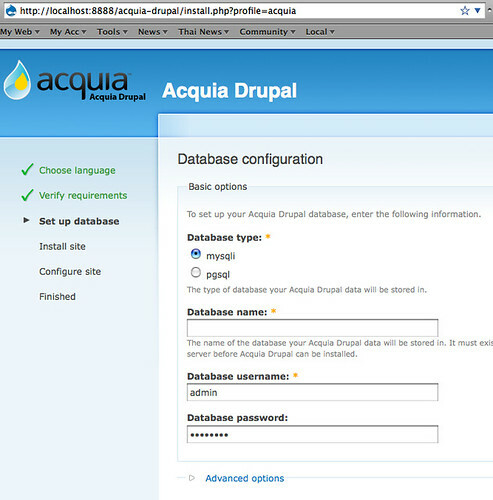 Everyone who is interested can download Acquia Drupal 1.0 from Download page. There are two options available: whole package for fresh install or upgrade kit for existing Drupal 6 installation. Since my blog is still using Drupal 5 so my only option is setting up a new Acquia Drupal site. My test environment is MAMP on Mac OS X 10.5. The installation process is same as normal Drupal. From the screenshot, please see the 'profile=acquia' is the URL. It's the method that standard Drupal provides for customization and distribution. In the second screen, you can see two new Acquia subscription fields for securely integration with Acquia Network. If you don't have subscription yet or don't plan to do so, it can be omitted. Nice. This section is what confuse me. From the information on their site, Acquia seems to manage my package update. 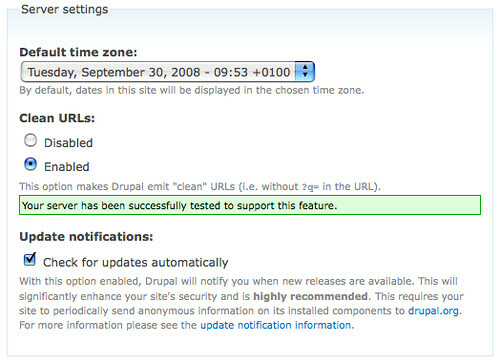 But the Drupal.org update notification option is still there (as standard Drupal). So my site will ping both Drupal.org and Acquia.com, right? After the setup process, you will be greeted by welcome screen. The first thing I notice is Administration Menu enabled by default. Nice. This will reduce learning curve on Drupal complex admin screen for the newcomers. It is quite disappointed me that Acquia Drupal comes with standard Garland theme, which I don't like (It just adds Acquia logo on the header). The second thing I want to know is how many new themes are bundled. So I check admin/build/themes screen. 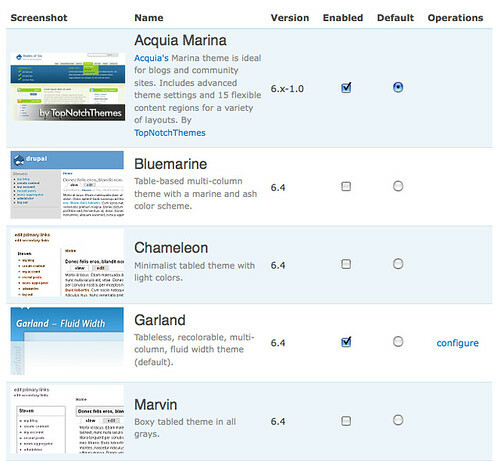 Only one new theme called Acquia Marina is bundled. It is credited by TopNotchThemes. My second disappointed. The next thing is to try how Acquia Marina looks like. As you see from screenshot, Acquia Marina can't handle long site title properly. Its appearance looks like amateur in my opinion. I think Acquia needs to do more homework on look & feel. As Drupal junkie, what I want to know is which modules are included in Acquia Drupal. The module list is available online at Acquia Drupal Modules. However, from the Features page, Acquia states that it includes Wiki and WYSIWYG (FCKEditor) functions into Acquia Drupal (which, in reality and module list, it doesn't). I think it's the bug in documentation/marketing team. This module list seems reasonable and sensible for me. It covers all necessary features for standard Web 2.0-liked site. All third party modules (except Acquia and Administration Menu) are disabled by default, which makes sense. The only enabled-by-default module that surprises me is Locale (from Core module). In my own understanding, not many Drupal sites use this feature since the maturity are English only web site. Is this related to the fact Acquia key people are from mainland Europe? While the module list is well selected, there is a flaw considered from commercial product standard. The way Acquia Drupal manages module is same as standard Drupal, which is module-based, not feature-based. Newcomers will face the situation "What is Token module?" and don't understand why it is included (while we geek know it's Pathauto dependency). I'm thinking of something like Ubuntu Add/Remove program. It is feature-driven approach. User just clicks on "SEO friendly" and all related modules (Pathauto and Token) will be installed at the same time. I hope to see this in the next version of Acquia Drupal. There is no special remark on usage. Remember, in term of functionality, Acquia Drupal is just Drupal. No difference. RHN offers update package to RHEL. 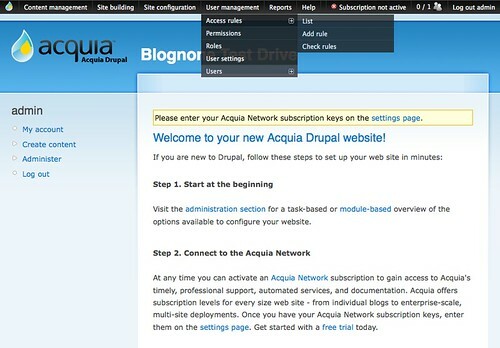 What does Acquia Network offer to Acquia Drupal? Code modification detection - in conjunction with Support service, Acquia technician will know what is modified in your system for better detection of problem. If you don't pay for Support, this feature is useless. Remote cron activation - if your server doesn't allow cron or you don't know how to run it, Acquia can ping cron.php for you. There are various plans of Acquia Network subscription service. See product matrix for detail. Every subscription type can access to all features listed above, they are just different in term of support service (e.g. you will get 24/7 support in more expensive plan) or the reliability guarantee on notification server. What I can't find on Acquia site is whether this free trial last forever? 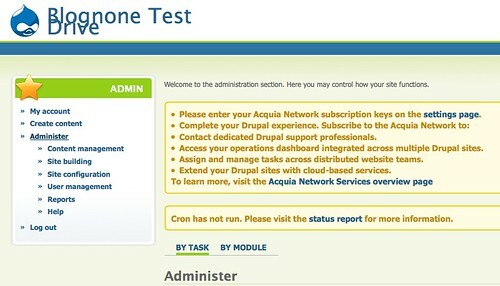 I got my answer from Administration Menu on Acquia Drupal. Once you apply for free Community Subscription, you will get the key for access Acquia Network authentication. The key to Mollom is provided separately (you can use your own existing Mollom key or just dismiss it if you don't use this feature). 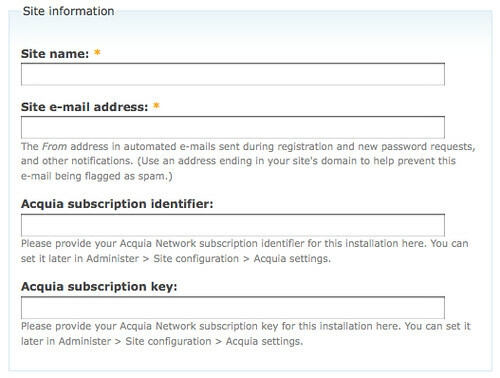 The next step is just putting Acquia key in admin/settings/acquia-agent and then your site is on the Acquia Network. 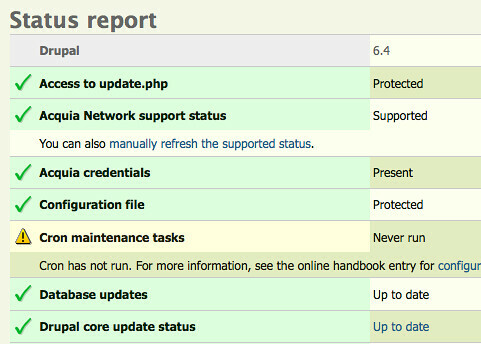 Now you can see from the Status Report screen, Acquia Network field is added from standard Drupal. Now your site is on Acquia Network, what's next? This confuses me at first. I try to find new Acquia Network options on my Acquia Drupal site, which doesn't exist. 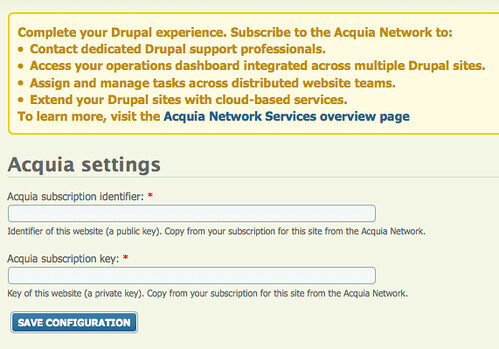 Every Acquia Network management task must be accessed on Acquia.com site, not your Acquia Drupal installtion. 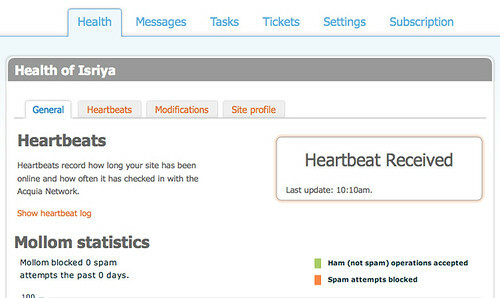 After logging in to my Acquia.com profile, I can choose one of my Acquia-enabled sites to monitor and manage. In my case, there is only one. Each site profile has six tabs. Health is status report of your site. It covers Heartbeat, Mollom, Statistics, and Modification. Like Mollom, other status are presented by pretty Flash-based chart and graph. Messages is just a logbook of your site. All events happen in your site are logged here. Tasks is for multi-admin site. You can assign the Acquia Drupal management tasks to one of your team. Kind of project tracker tool. In my case, it's single user site so no use. 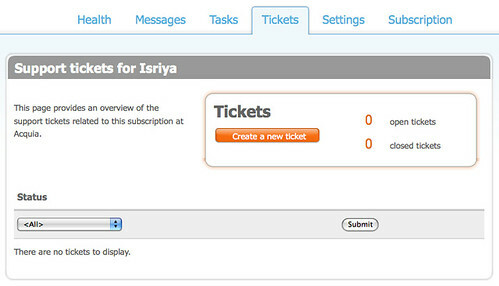 Tickets is the online channel for communicate with Acquia support team (beside of phone call, if you buy it). My subscription is just free trial so support is not included. If I try to create a new ticket, I will got access denied screen. 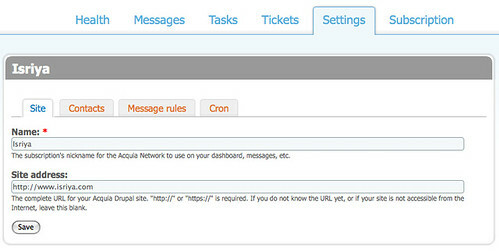 Settings is just panel you can change contact detail, email notification and Acquia's cron service for your site. 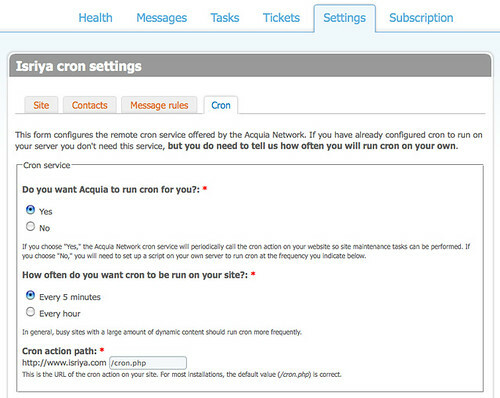 This is the setting screen of Acquia's cron service. Subscription is your account summary. What you get after pay for Acquia. As a Drupal geek, I can do everything Acquia offer by my own so no reason to spend my money. (I'm not their target anyway) However, if some commercial companies who want to have a good Drupal site with comprehensive service and support, Acquia is definitely competitive choice. Acquia seems to be on the right track with Red Hat business model. I hope they can make fortune from this approach (and have money to hire me :D). While Both Acquia Drupal and Acquia Network are still not perfect, they looks promising. 5 or more world-class themes out of the box. Automatic update process. Like Windows, Ubuntu, or Firefox, just a single OK click and your site is up to date. Better Add/Remove screen for module management, as mentioned above. WYSIWYG (with tidy code and file upload) turn on by default. WordPress.com standard. Automatic Update for Drupal is the one I long for. Even Wordpress has it. Why not Drupal? WYSIWYG may be critical for social network community. But if you look at Facebook, they don't have one in the wall. So I don't mind if I have to use markdown/textile for comment. As for content, it's another story. In fact, when I read Update notifier, I thought it is automatic update feature. PS. I always thought Mollom is a service from Acquire. Thank-you for taking the time to do such an extensive review. It's great to see our product through your eyes. We have a lot of improvements lined up, and we are looking forward to continuing to improve the product and contribute these improvements back to the Drupal community.